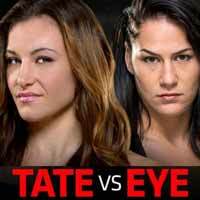 Review by AllTheBestFights.com: 2016-11-12, close fight but not so exciting: Miesha Tate vs Raquel Pennington gets two stars. The former Strikeforce and Ufc champion Miesha Tate entered this fight with a mma record of 18-6-0 (56% finishing rate) and she is ranked as the No.3 women’s bantamweight in the world. She has fought twice in 2016 beating Holly Holm (=Holm vs Tate) and losing to current #1 Amanda Nunes (=Tate vs Nunes). 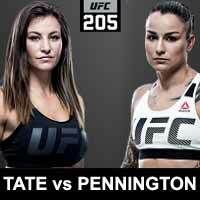 Her opponent, Raquel Pennington, has an official record of 8-5-0 (50% finishing rate) and she entered as the No.8 in the same weight class. She was defeated by Holly Holm last year but then she has won three bouts beating Elizabeth Phillips in her last one. Tate vs Pennington is on the undercard of Eddie Alvarez vs Conor McGregor – UFC 205. Watch the video and rate this fight! Review by AllTheBestFights.com: 2016-07-09, good fight between Miesha Tate and Amanda Nunes: it gets three stars (UFC Performance of the Night). The former Strikeforce and current Ufc Bw champion Miesha Tate entered this fight with a pro mma record of 18-5-0 (56% finishing rate) and she is ranked as the No.1 women’s bantamweight in the world. She lost two consecutive fights in 2013, against Cat Zingano (4-stars-fight, Tate vs Zingano) and Ronda Rousey (=Rousey vs Tate 2), but since then she has won five consecutive bouts beating Holly Holm in 2016 (=Holm vs Tate). Her opponent, the black belt in Brazilian jiu-jitsu Amanda Nunes, has a record of 12-4-0 (92% finishing rate) and she entered as the No.6 in the same weight class. She also lost to Zingano, in 2014 (=Zingano vs Nunes), but then she has won three fights defeating Valentina Shevchenko in 2016 (=Nunes vs Shevchenko). 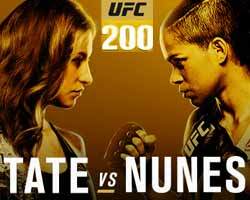 Tate vs Nunes, main event of the Ufc 200, is valid for the Ufc women’s bantamweight title (Tate’s first defense); on the original fight card the main event was Jon Jones vs Daniel Cormier 2 but on June 6, 2016, ‘Bones’ was pulled from the card after potentially failing a drug test. Watch the video and rate this fight! 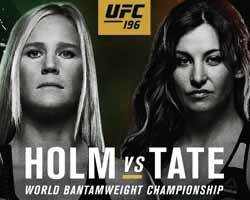 Review: 2014-04-19, pretty good finish between Miesha Tate and Liz Carmouche but it is not enough to get three stars. Miesha Tate entered this fight with pro mma record of 13-5-0 (69% finishing rate) and she is ranked as the No.9 women’s bantamweight in the world, she fought and lost twice in 2013: against Cat Zingano (four-stars fight Tate vs Zingano) and the rematch against #1 Ronda Rousey, bout valid for the Ufc women’s Bw title (=Rousey vs Tate 2). His opponent, Liz Carmouche, has a record of 9-4-0 (89% finishing rate) and she entered as the No.11 in the same weight class, she fought three times in 2013 winning only against Jessica Andrade (=Carmouche vs Andrade) while she lost to Ronda Rousey for the Ufc belt (four-stars fight Rousey vs Carmouche) and to Alexis Davis in his last bout (=Carmouche vs Davis). 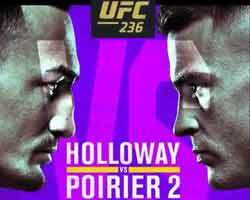 Tate vs Carmouche is on the undercard of Fabricio Werdum vs Travis Browne – UFC on Fox 11. Watch the video and rate this fight! Review: 2013-12-28, exciting fight thanks to an aggressive start, excellent work on the ground, high pace and some nice takedowns: the second fight between Ronda Rousey and Miesha Tate is very close to get four stars (UFC Fight of the Night). The undefeated Ronda Rousey (7-0-0, 100% submission armbar victory rate in the first round) entered as the No.1 women’s bantamweight in the world while Miesha Tate (13-4-0, 69% finishing rate) entered as the No.9. In their first fight Rousey defeated Tate by submission (March 3, 2012); this second fight is valid for the UFC bantamweight title and it is on the undercard of Chris Weidman vs Anderson Silva 2 – UFC 168. Watch the video!